Having already found successes in the Albatros D.I and D.II models, designer Robert Thelen sought for more in the way of manoeuvrability for the new Albatros D.III. This was accomplished by a new unstaggered wing. The wings comprised a longer-span upper wing with raked tips and a narrow-chord lower wing in a sesquiplane arrangement with V-layout interplane struts. The D III retained the fuselage and empennage of the D II but added a version of the D.III engine with a higher compression ratio for slightly more power. 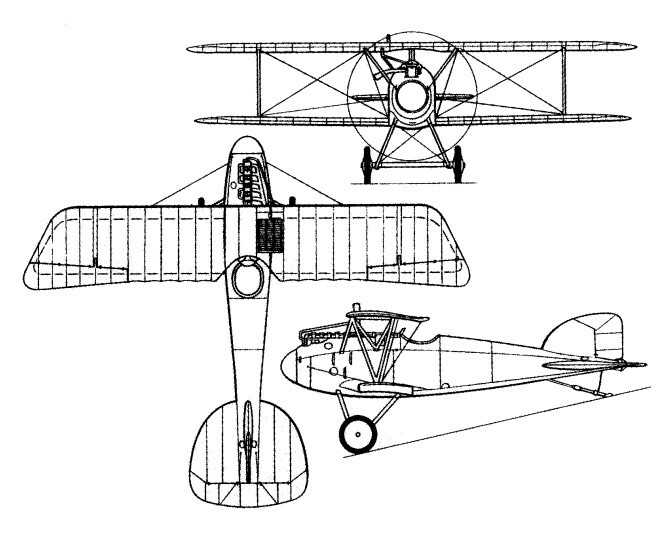 The D.III featured a semi-monocoque structure with plywood skinning. The pilot sat at the relative center portion of the fuselage in an open-air cockpit just behind and under the top wing. The top wing was lowered enough to allow for improved visibility. The engine sat before the pilot under the twin 7.92 LMG 08/15 machine guns synchronized to fire through the spinning propeller blades. The two-bladed propeller featured a large cone-shaped spinner. The undercarriage consisted of two fixed struts, each with a wheels while the empennage held the tail skid. D.III's were in operational service in some quantity by December of 1916 and the new wing arrangement immediately proved to offer better manoeuvrability. Power was provided by a Mercedes D.IIIa series engine which was progressively uprated from 170 horsepower to 175 during the production run. By the spring of 1917 the D.III equipped all Germany's 37 Jastas. After some operational service, the radiator had to be shifted from the center to the right side of the upper wing. This was done as the pilot would incur serious burns should the radiator become punctured in combat (this production change was included in the 290th aircraft and onwards). Albatros soon found that failures of the leading edge and lower wing ribs were becoming all too common - leading to cracks or outright failures. As such, D.IIIs were grounded for a crucial period until the problem was located and addressed. The D.III would have to wait until February of 1917 to be back in action, this time with a reinforced lower wing. New production models featured this fix while previous service models were pulled and reinforced. The structural deficiency was directly attributed to the main spar being set too far to the rear of the design. This effectively caused a twisting of the wing, most notably during a dive or an action introducing high stress loads to the wing. Some of the earliest D.IIIs were assigned to Jagdstaftel 11, the squadron commanded by Baron Von Rich-tofen. As a result of numerous wing failures, restrictions were put on the diving speed of the D.III. The cause was the weakness of the V-strut supporting the lower wing, which permitted twisting under load. Equipped with the D.III, the German figh-ter squadrons rapidly asserted their superior-ity over their Allied opponents in the early months of 1917, culminating in 'Bloody April'. During that month the Royal Flying Corps, in spite of Allied superiority in single--seat fighters of 358:114, suffered aircrew losses totalling over 40%, and the average life expectancy of a British airman on the West-ern Front dropped to 23 days. There were many minor variations, and Oeffag (Austrian-built) models had Austro-Daimler engines of up to 225 hp. Nearly 500 D.IIIs were at the Western Front in late 1917, but Albatros found it outclassed by the Allies' Triplane, Camel, SE.5a and Spad VII. The D.III stayed in operational use into the final year of the war despite being overtaken in all performance categories - particularly by the British Royal Aircraft Factory S.E.5, French SPAD S.13 and Sopwith Camel models of the Allies. Engine: l x Mercedes D.IIIa, 127 or 130kW (170 or 175hp).